Jul 10 Can I Use a 100W Equal LED Bulb in a 60W Socket? Lately, there has been a lot of speculation surrounding the switch to LED light bulbs, especially when it comes to wattage equivalents and brightness. One question that often comes up is this: “Can I use an LED with a higher wattage equivalent than the bulb I am replacing, such as a 100-Watt equal LED bulb in a 60-Watt rated socket, to get more light from my fixture?” The short answer is yes—as long as it still consumes fewer watts than the fixture is rated for. The wattage rating on fixtures such as ceiling fans, lamps, or general overhead lights exists for safety reasons; to prevent light bulbs (primarily incandescents, which generate a lot of heat) from damaging bulbs or fixtures. Unlike incandescents, LEDs are able to convert much more of the energy they are supplied with into usable light rather than heat. In fact, it’s the main reason they are so efficient. The term “60-Watt equal” has little to do with any kind of wattage correlation; a 60W equal LED may use as little as 8 Watts to operate. It simply means that the bulb, whether CFL or LED, is able to produce as much light as a 60-Watt incandescent. While the general rule of thumb with incandescents is the higher the wattage, the brighter the light, with energy-efficient bulbs (which all use very little power) you should be paying attention to lumens instead. Lumens are the direct measurement of brightness; not watts, which measure power requirements. 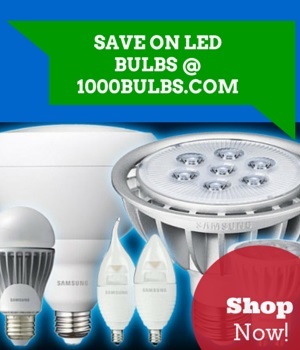 LED bulbs that deliver 800 lm are considered to have equal light output to standard 60W bulbs. 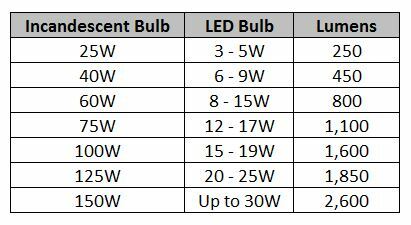 Consider the chart below to learn the average amount of lumens for popular incandescent bulbs. The bottom line? If your fixture is rated to accept 60 Watts, you can safely use 75W, 100W, or even 125W equal bulbs (which all draw less than 50 Watts of power) instead. Just know that 100W and 125W equal LEDs are typically made in a slightly larger A21 size, so be sure that your fixture can accommodate the larger measurements—and that you really want the additional brightness! Have any lingering questions or comments about this article? Share them with us below and be sure to follow us on Facebook, Twitter, Google Plus, LinkedIn, Pinterest, or Instagram for more lighting updates!